SWAMIJI is the world’s first, full-length laser documentary on the great monk and takes the audience on a journey that starts from his birth and ends with the Mahasamadhi. 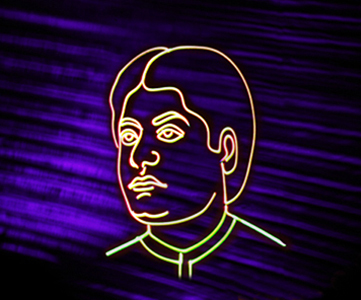 The unique show will be premiered on October 10, 2012 at the Grand Theatre of The Science City, Calcutta, followed by other major cities in India, USA and other countries to celebrate the 150th birth anniversary of Swami Vivekananda. The innovative one-hour documentary starts with black and white original images from the pages of an old picture book where the audience visits famous scenes from the 1893 Columbian Exposition in Chicago before arriving at the Columbus Hall of the Art Institute. There, Swami Vivekananda gives his famous speech at the Parliament of Religions, whose opening line produced a standing ovation that lasted over two minutes. 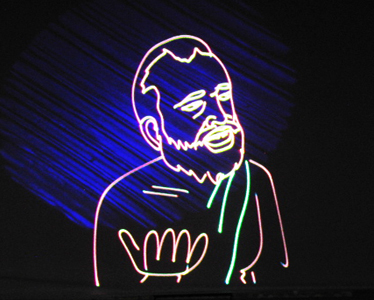 As his message of religious tolerance is carried out and white doves are seen flying from the roof of the Art Institute, the pages flip back to the front page as the black and white images come to live in colorful laser lines and three-dimensional visual effects to narrate the story from the beginning – all through the medium of the state-of-the-art lighting technology. Black and white rare pictures from "Swamiji", where Swami Vivekananda gave his famous speech. (Top) The Art Institute, 1893. (Left) Floor plan of the Art Institute in 1893, by architects Shepley, Rutan, and Coolidge of Boston. 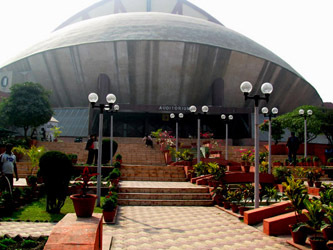 The Columbus Hall is the left gallery, where Swamiji gave the speech. To its right is the Washington Hall. 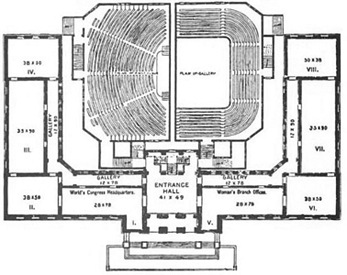 Note that for architectural convenience the Columbus Hall shows the lower floor plan, while its balcony plan is shown in the Washington Hall, which were applicable to both. 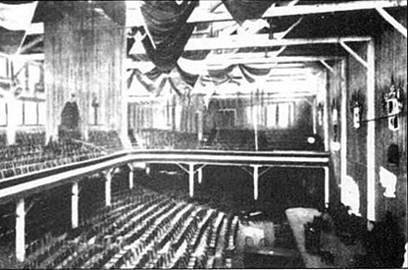 (Right) A photograph of the seat arrangements of the Columbus Hall. It accommodated 4000 people, who stood up to give a standing ovation to the great speech of Swamiji. 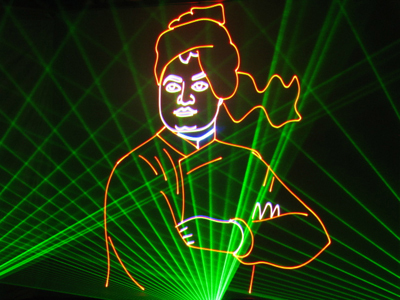 The laser documentary is preceded by a Prayer and Vandana, a laser-live extravaganza paying unique homage to the Holy Trio, Sarada Devi, Ramakrishna and Vivekananda. The entire approximate 90-minute show is conceived as a pure, educational, entertaining, and magical experience for the entire family. The research for this project started several years ago when Manick Sorcar, its creator, personally visited the Art Institute. It was his heart's desire to do a laser documentary on the life story of Swamiji who has been the inspiration all his life. Then an invitation from the Ramakrishna Mission Cultural Institute to do this unique documentary to celebrate Swami Vivekananda's 150th birth anniversary made his dream come true. SWAMIJI is the outcome of a thorough research and a unique mix of science with art, which is designed to be entertaining and educational for the whole family. Manick Sorcar Productions welcomes all parties from around the world and sincerely thanks those who have left messages on phone regarding this show. We strongly suggest to contact us via email; each will be responded promptly.